This will be my first foray into designer high end cosmetics. Which basically means very expensive but luxury products. 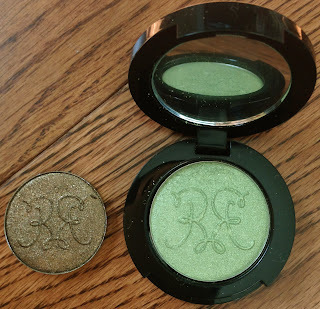 I had heard so much about Rouge Bunny Rouge being a wonderful brand and that their eyeshadows were noteworthy that I decided to take advantage of their summer sale one night when I was feeling especially crappy. I did research the heck out of these before purchase though due to their expense. 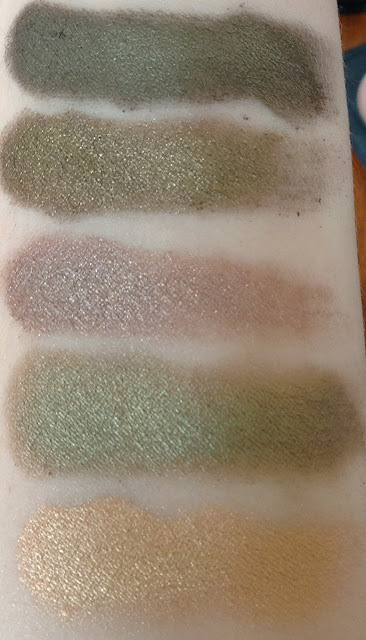 I read a ton of reviews, looked up a bunch of swatches and even chatted with some people on a makeup forum board (Make-up Alley these peoples are the best!). I did purchase six eyeshadows and one liquid blush/ gloss duo which will be divided into four reviews so you can really get an idea. As I spent over a certain amount I also received a free metal keychain too. First some general thoughts. I hated the shipping method. HATED IT. Yes it shipped surprisingly quickly but if you don't order the minimum for reduced international shipping it costs about $20. That's crazy. Plus I wasn't told when the delivery man was coming so I missed the first two times he came as I was out of town. Then I found a slip on my door saying they weren't going to deliver again and that I owed an additional $40 in delivery fees and taxes (the taxes I'm okay with, I don't like them but they are a reality. However over $20 in extra delivery fees that I supposably already paid for was just bullsh*t.) Then I had to spend over half an hour trying to contact the delivery company (DHL if you're interested) just to get them to try and re-deliver, as their main office to pick up the package was hours away. Then of course the delivery I stayed home for didn't come. I had to spend another half-hour trying to contact them again. The blithered on about how they didn't know why the package didn't come. Basically if I hadn't called they wouldn't have delivered it again despite having made an appointment. Then I had to play phone tag for a bit with a supervisor to insure my package came the next day (holding up three of us before we were supposed to leave so we were there for the stupid package). On top of that the man wasn't exactly pleasant. You can be sure I will never be doing anything with DHL again and if I buy from Rouge Bunny Rouge again it won't be through their main boutique website but through a retailer instead. I also purchased Delicate Hummingbird in the same style (refill pan). Delicate Hummingbird is a medium-dark purple taupe shimmer. Resplendent Quetzal is a lovely soft lime green with a tad of gold. This is also a shimmer shadow and it came in the full eyeshadow packaging with the single 2.4 gram pan in the black solid compact. It has it's own small mirror and like all the eyeshadow packages the strange flower fluff silhouette on the top. Fire-Tailed Sunbird is in the full packaging too and is a medium-light coral peach with a pink reflect. Periwinkle Cardinal is a midtone green-aqua shimmer. It's quite unique with an almost silver-blue shimmer to it. And finally I bought the full size matte eyeshadow in Bashful Flamingo a light peach-pink almost skin colour shade. This is also 2.4 g in size and in the same packaging as the shimmer shades. The lip gloss liquid blush duo I purchased was in Rumba- Cubana. The lip gloss (Rumba) is a lovely cream rosewood shade that is a perfect my lips but better shade and the liquid blush is in a dark peach-pink. This first review will be for Resplendent Quetzal and Abyssinian Catbird. Both of these eyeshadow names are based off of real bird species. 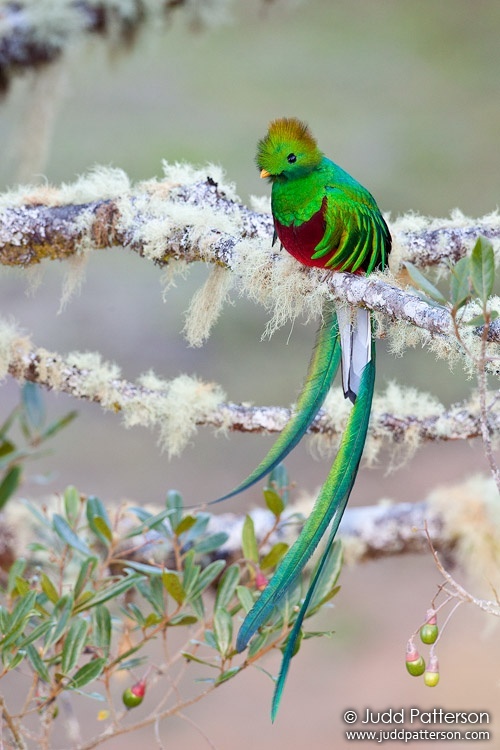 I actually adore the Resplendent Quetzal, it may be my favourite bird species. So beautiful! With Resplendent Quetzal you can easily see where the colour of the eyeshadow came from but I looked and looked at pictures of Abyssinian Catbirds and couldn't for the life of me find any khaki or bronze on them. This bothers me as there are so many bright and colourful birds out there with every colour plumage in the world and you name an eyeshadow after one that doesn't have any on it. So weird. I mean use the name, just match it to the colour, like the beautiful red-orange on the species rear. That would be a lovely shadow and fit the name. Above is in the direct sunlight. As you can see Abyssinian Catbird is a rich brown-khaki and Resplendent Quetzal is a light lime with golden tones. Above the same eyeshadows in indirect light. 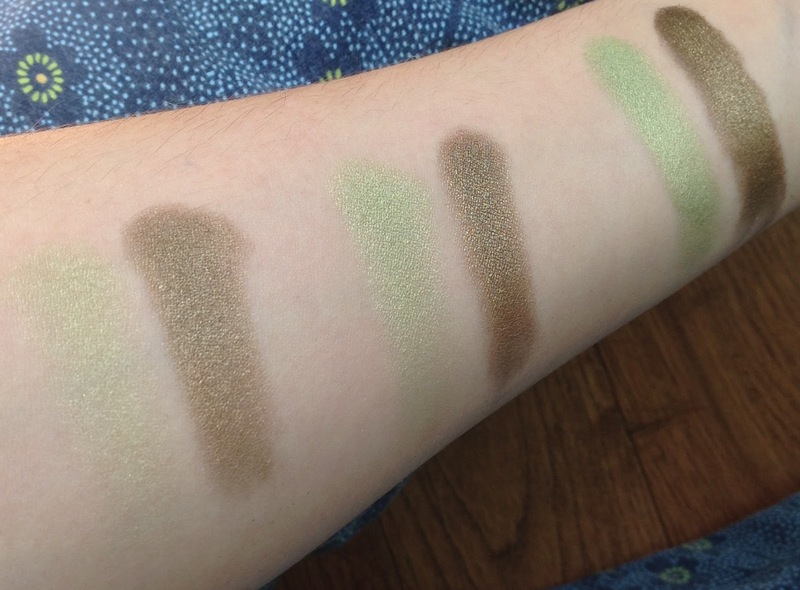 Here are the two shadows swatched. The first pair on the far left is without any primer, just on bare skin. The middle pair is on Too Faced Shadow Insurance, and the last most intense pair is on Pixie Epoxy. As you can easily tell to get the most out of these shadows you have to layer them over Pixie Epoxy, especially the Resplendent Quetzal. As for the long lasting claim on these I've found only the Abyssinian Catbird can live up to it- and only on bare skin. For some strange reason these don't stick around over primer, so sadly these shadows need to be layered over top of Pixie Epoxy. Which is a bit of a pain for a pressed eyeshadow. The Abyssinian Catbird is really rich in pigment. I hardly have to use any at all to get the look I want. It also doesn't crease on me. The Resplendent Quetzal however needs multiple swipes to get the intensity you want from it. However because of this you can get a very wearable even office friendly look. It's a very subtle green due to it's warm tones. Unlike a bunch of other greens (even the closest of my stash shades which you can see later on in the review) it isn't in your face. They're both lovely unique shades but overall the Abyssinian Catbird is the better shadow. However both fade over eyeshadow primer relatively quickly when in comparison to over shadows and to really come alive you need them either wet or over Pixie Epoxy. I wanted to show how unique the two shades are so I swatched them over Pixie Epoxy beside anything similar in my collection. Some were way off as you can tell! Above is the similar shades for Abyssinian Catbird. As you can tell none of them are all that close to be considered dupes. Then of course after I finished that arm and washed it off I found another one that was closer and needed to compare it too so that's the photo below. Next of course is the closet of my stash to Resplendent Quetzal. 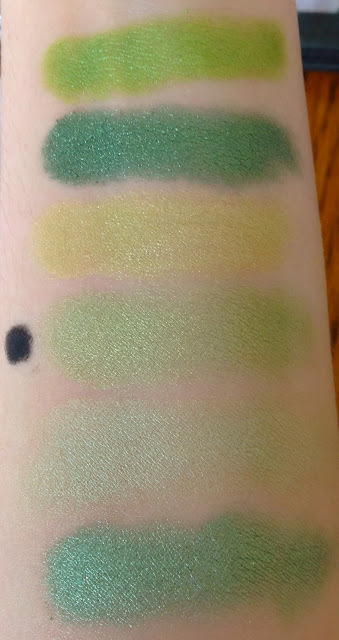 I've marked with a black circle in pencil eyeliner beside the Resplendent Quetzal swatch so you can easily move your eye back and forth between the shades without constantly trying to remember which is the real one. I know I always tend to lose the shadow in question and have to find it again. Hopefully this will help anyone else who gets easily distracted! And of course like the Abyssinian Catbird shade I found a closer shade after the fact too. This one is from the old Limited Edition Wet n' Wild holiday palettes that came out in 2011. It's the second/middle of the green shades from the Snow Sprite palette. 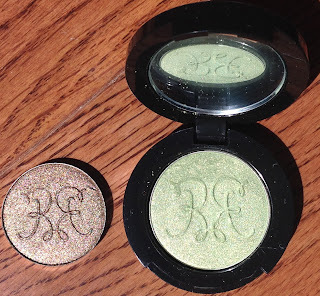 The Wet n' Wild shade actually has a green reflect you can only partially see in the shot above whereas the Resplendent Quetzal has a more golden tone. However I wouldn't say you need both. The Rouge Bunny Rouge web boutique offers a 20% discount to established bloggers if you contact a representative. I also purchased these during their summer sale so I did get a bit off there too. However normally these are priced 20.17 Euros or approximately $26.88 USD for the larger shadow in the compact. The refil pans are 14.29 Euros or approximately $19.04 USD. No matter the currency you choose on the site you will be billed in Euros so keep that in mind. The Resplendent Quetzal is in the full compact size and the Abyssinian Catbird is in the refill size. If you can get the refill size, do so as they are the size of a Mac eyeshadow pan and will fit into almost all refillable palettes. I don't recommend buying their refillable empty compacts due to the price of them. If you're like me you aren't ever going to get through a full one of these shadows anyways. Would I buy these shadows again? As much as I like the Resplendent Quetzal (especially the name) I wouldn't purchase the shade again as I do have the Wet n' Wild Night Elf palette. The warmth of it is wonderful and very unique but I dislike you need to use Pixie Epoxy or another sticky base to make it last all day. As for Abyssinian Catbird due to the richness of the shade and the excellent pigmentation as well as the ability to last on the lid (even if it doesn't cooperate with primer at least it doesn't crease, though it does fade a bit) I would purchase it again, even with the crazy price of these. It's very unique and much more complex than my photos show. There is more of the Rouge Bunny Rouge products reviewed in Part Two and Part Three.